I love growing my own cucumbers. Cucumbers are a perfect addition to any salad, or simply eaten all by themselves. My favorite cucumber dish actually comes from my dad, and I must admit, I have no idea where he got it or where the “recipe” is derived from. You simply slice up a cucumber, and mix in some vinegar and mayo. There really is no recipe for it, as I mix the the vinegar and mayo together in portions until it gets to a flavor that I like. But enough about eating cucumbers, lets talk about how you can grow cucumbers. Cucumbers can be grown as bush or indeterminates (vining). 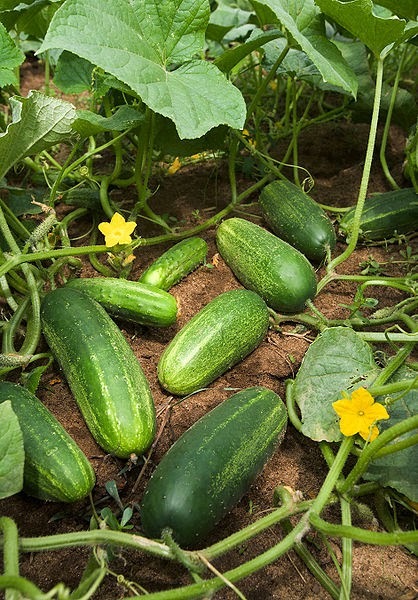 Bush cucumber varieties are nice because they are “controllable”, grow well in small raised beds or containers, and are very good producers. Indeterminate cucumber varieties are those that grow on a vine. You can still “control” where these cucumber varieties grow with the use of a trellis or some other structure that the cucumber vines’ tendrils can grab on to, and they are prolific producers. I grew straight 8’s one year and produced nearly 250 pounds of cucumbers from about a half dozen plants. Your results may vary of course. I grow my cucumbers directly from cucumber seeds. I don’t feel that getting established plants are necessary as my growing season is plenty long for me and cucumbers are very easy to grow from seeds. I like to start my cucumber seeds indoors about 2 weeks prior to the final frost in my area. Once the fear of frost has subsided, I will move my cucumber plants to their final growing place in my garden that receives a full day’s worth of sun and where I have conditioned my soil with plenty of vermicompost that I harvest from my worm tower. Cucumbers are heavy feeders, so even though I have conditioned my soil with quality compost, I still need to constantly feed them throughout the season. Use a good organic fertilizer such as manure tea or fish emulsion every two weeks for best results. When planting your cucumbers, if you are growing indeterminates up a trellis, space out your plants every 12 to 16 inches. If you are not using a trellis, you will need a good 3 feet. Then again if you are not using a trellis, go with the bush varieties. You can save on space that way as they get by on as little as 12 inches of space. That would be 1 square per plant if you are a square foot gardener. Give your cucumber plants a nice steady and even dose of water throughout the season, and as mentioned before, cucumbers will produce best in a full day’s worth of sun. Cucumbers are ready to harvest when they are at a size that meet the needs for which they are being produced. For example, if you are going to following a gherkin pickle recipe, you will want to harvest your cucumbers when they are very small. Most of the time you will pick your cucumbers when they are 10 to 12 inches in length. Any larger than that and they will be too “seedy”. Of course if you are looking to save the seeds to grow the same variety the following season, you will want to simply let the cucumber continue to grow to produce the seeds. As a side note, avoid rotating with other cucumber family members. In this week's episode Mike talks with Angela DiMaggio of MobileGro. Listen to this heart warming story of Angela's journey from retired school teacher to following her gardening passion to a successful business with the MobileGro. Angela DiMaggio is a retired school teacher currently residing in Arizona. Originally from Wisconsin (a self proclaimed cheesehead), Angela drew up a mock design of the MobileGro some years ago while at her teacher's desk, put it in the drawer and forgot all about it. On the day she was cleaning out her desk, as she was ready to head into the sunset for retirement, the scribbled drawing of what would be become the MobileGro had fallen into her lap. With that drawing and a passion for gardening, what was supposed to be retirement, slowing down and enjoying life, turned into a successful business with a gardening product that is not only practical, but as she quickly came to find out, useful to customers with special needs. In this week's episode Mike talks with fruit tree expert Elmer Kidd of Stark Bros. Nursery about how you can get started growing your own fruit trees right at home. Elmer brings to the podcast over 40 years of experience in the field of fruit trees, their care, proper maintenance and cultivation. Listen in as Elmer gives you an encyclopedia's worth of valuable information that is sure to get you excited and motivated about growing your own apples, peaches, and pears right at home. Celery is a great vegetable. In my opinion anyway. Celery adds wonderful flavor to soups, stews and celery tastes great raw with some peanut butter on it. The best part is that you can grow your own celery right at home. Celery will take some time and little more work than most vegetables, but the satisfaction you will get from growing your own celery will be tremendous. Celery seeds are very and I mean VERY small. In fact, celery seeds are so small, it is impossible to plant a single celery seed. More on that in a moment. I would highly recommend that you start your celery seeds indoors for a couple of reasons. First, celery takes a long time to grow to maturity and if you have a short growing season you will never be able to grow celery by direct sowing outdoors. Second, because celery seeds are so small, you can take a small pinch, plant them in your starter pot, and as they germinate and grow, you can thin them back by using a pair of scissors to “thin the herd” so to speak. With your celery in individual pots, it makes that process a bit easier. When sowing your seeds, sprinkle them on top of the soil in your starter pots and then lightly (I emphasize lightly) cover them with some more soil. You can expect your celery seeds to germinate in 7 to 10 days. You will do much better if you use a humidity dome, cloche, etc. As a side note, I would also recommend that you start your celery seeds indoors about ten weeks prior to the last frost in your area. That will help you get a jump start. Believe me, it will be well worth it. Once your seeds are germinated and they are ready to move outdoors, choose a location that receives full sun, celery, however, will do well in light shade. Space out your celery starts about eight to twelve inches. Celery grows best in soil where the pH level is 6.0 to 7.0. Be sure to take a reading of your soil at the beginning of every gardening season so you can adjust that level as needed. Fertilize your celery bed throughout the season. Your celery will need plenty of nutrients to grow and thrive. Fish emulsion is a great fertilizer to use, but you can also use your finished compost if you are fortunate enough to have the room for a compost pile. 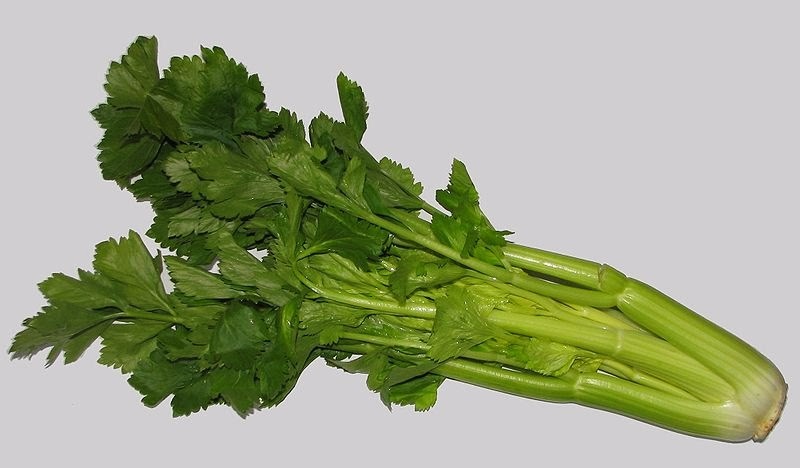 Your celery is ready to harvest when the stalks are long enough to your suiting. Usually takes anywhere from 130 to 180 days. Of course that depends on the variety that you choose to go with.